As well as our flower preservation we also have our www.rosepetals.com.au website that we sell our freeze dried rose petals on. Unlike fresh petals, freeze dried rose petals will last for months and can be bought ahead of time in your colour choice. We source fresh petals from farms in Adelaide and Brisbane and then put them through our freeze drying chamber with similar methods to when we preserve our wedding bouquets. Freeze dried rose petals look and feel just like fresh petals, they also hold their shape, colour and are totally bio-degradable. Our dried rose petals can be used for anything from marriage proposals to flower girls. We are noticing how different states have different trends in colours. Currently orders from Sydney seem to be all pinks and purple and Melbourne our vibrant bridal red. Last year it was the opposite 🙂 They also look great in wedding photos when thrown in the air by your guest!! We also supply many of the Day Spas and Hotels around the country. We seem to have a huge rush from the Sydney and Melbourne hotels and Brisbane Day Spas at the moment so there must be plenty of weddings happening!! Many venues now will not allow decorating with fresh petals due to the staining of carpets and table linen which makes freeze dried rose petals a great alternative! 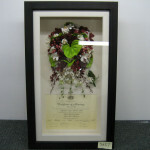 Remember if you have any questions (or would like to discuss our flower preservation and framing) feel free to give a us a call on 1300 767 670 or go to www.rosepetals.com.au to have a look at our colour range of petals. All purchases can be made online.